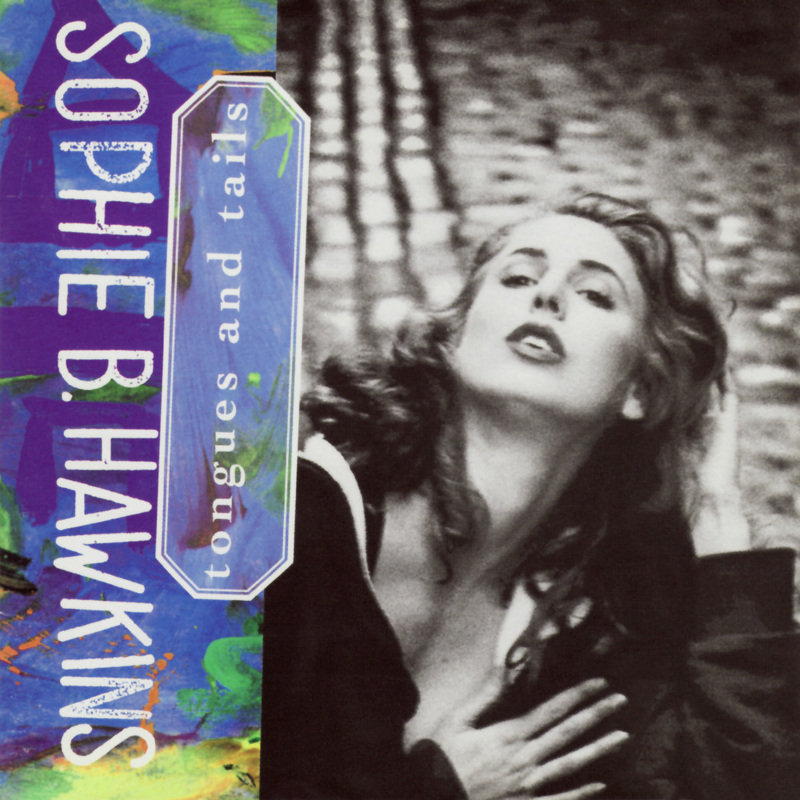 Today’s POP RESCUE is the 1992 debut album Tongues And Tails by Sophie B. Hawkins. The album opens with the gentle rumblings of a train that usher in her a moderate #14 UK hit Damn, Wish I Was Your Lover, giving her mainstream chart attention in 1992. The soft beats soon interrupt this, before her vocals join in. This is a wonderfully breathy song which builds well in the chorus and adds more instruments into the second verse. If Sophie hadn’t recorded this song, I could easily imagine Belinda Carlisle giving us a credible performance instead. However, the song feels about 1 minute too long, weighing in here at 5m 24s. This is followed by second single California Here I Come, which is a much more mellow song. The soft beats The single stalled, reaching #53. Again, her vocals could easily be swapped with Carlisle’s. The song features the Lord’s Prayer spoken part way through this song, making it feel a little clunky as a synth and beats play in the background. It just feels like a nice filler. Funky wah wah guitar, samples, and a up-tempo beat starts Mysteries We Understand as a thick bassline weaves through he racing beat. By contrast, this song is far stronger than California Here I Come, and should have been a single. This is pretty catchy, and the backing vocals really help to add depth to Sophie’s vocals. Missed opportunity here. This is followed by Saviour Child, again we hear the street foley, as Sophie takes the mic over a slow synth. There’s some random vocals in the background, one of which sounds like Cookie Monster. Whilst this song is pretty stripped back until after the chorus, Sophie’s vocals sound a bit weak here, and it doesn’t really capture my attention very well – it feels like an attempt at an 80’s power rock ballad. Carry Me is up next, opening with a gentle snare rolling over a laboured synth sequence. This soon turns into a simple beat with some echo-y ‘carrrrryyyyy’ vocals as a piano joins in with a simple melody. Sophie arrives for a spoken-word song that reminds me like it belongs on the Historie de Melody Nelson album by Serge Gainsborough instead. This sounds a bit like a wandering jam session. I don’t know what this is doing here on this album. Third and final single, I Want You, is a cover of Bob Dylan’s 1966 track. Once again, the song opens with some more street foley before a heavy bass line comes in, with those muted beats that you hear in the opening single. A brief oriental riff adds to the mix. Sophie takes the well-trod lyrics with ease, and her vocals helps to build a credible cover of what Dylan would have snarled out. The song is very different from his jollier version. The song also stalled, reaching #49 in the UK chart. Before I Walk On Fire follows, with a shudder from Sophie, some rapid snares and bass drums. It’s bassline feels like it’s a precursor for her 1994 hit Right Beside You. A cello arrives and instantly gives the song a down-beat sad feeling just as Sophie sings ‘I’m sorry, I’m sorry of being scared’. Next song We Are One Body reminds me of Damn – it’s bass, synth sequence and muted drums. Sophie gets a few layers of vocals here – which sounds pretty good as percussion races behind her, but the lyrics make the song sound like something you’d expect as an up-beat modern interlude on Songs Of Praise. Listen begins with a howling wind and a tiny little almost-glockenspiel sound. Snoring/growling and a flute of sorts joins in as a hi-hat adds tension. ‘Listen’ says Sophie. A gothic organ plays in the background before electric guitars roar and the drums burst into a full rock song. ‘I’m gonna turn you on. You’re gonna set me free. I’m gonna make you come. You’re gonna live with me‘ she screams alongside the guitar. Suddenly everything drops out again back to the howling wind and flute. Hardly Thriller, but I can see what she was trying to do. Almost. Penultimate song Live And Let Love is up next, and this is an improvement on several of the previous songs. There’s some really nice backing vocals here, although the brass section sounds like it was recorded on a cheap Bontempi keyboard. At times it’s hard to make out the lyrics but the vocal patterns sound nice at least. The album closes with Don’t Stop Swaying, which gives Sophie a chance to show off her vocal range and power over a slow echo-y beat and a nice little bells sequence. This song is full of vocal layers, singing, more spoken word, and sounds almost as if it belongs on an Enya album or on Madonna’s Like A Prayer album. It’s a nice sound, but it doesn’t necessarily feel like a song, even though it sounds like a natural closing track for an album. Over all, aside from Damn Wish I Was Your Lover, Mysteries We Understand, and I Want You, there’s little else here that really stands out. The rest of the songs are good, but they just don’t really make you tap your foot, or stick in your brain. Really hit and miss. Where is Sophie B. HAWKINS now? After the commercial stumbling of this album, and the low charting of the singles in the UK, she released her second album Whaler in 1994. It gave her another hit with the lead single, but it too got stuck outside the top 40 of the UK album charts (at the same position, #46). With her UK career chances scuppered, her last appearance was single As I Lay Me Down in 1995, which gave her a #24 charting. After releasing a film of her tour, and leaving her record label due to disagreements related to her third album, she set up her own record label in 2001. She has stared as Janis Joplin on stage, and has occasionally appeared on TV. Posted in 1990s, Sophie B. HawkinsTagged 1992, album, California Here I Come, Damn Wish I Was Your Lover, I Want You, review, Tongues And TailsBookmark the permalink.